Ben Fisk is general manager, Methods3D, Sudbury, MA; www.methodsmachine.com. 3D metal printing (3DMP) is the hottest subject throughout manufacturing. This technology is revolutionizing how companies design, test, manufacture and distribute products. With all the hype surrounding 3DMP technology, what are the effects on manufacturers serving key markets for machined metal parts, including aerospace, medical and automotive, and what are the key takeaways? We have identified five things manufacturers should understand before entering the 3DMP workspace. 1) 3DMP provides the ability to create components that most directly embody and enable true design intent. The freedom possible in the manufacturing process allows designers to create optimal designs without restrictions from conventional manufacturing processes. Shown is a metal bracket printed on a 3D Systems laser-sintering direct metal printer. The freedom possible in the 3DMP process allows designers to create optimal designs without restrictions from conventional manufacturing processes. Design for manufacturability (DFM) has long been the method by which components were designed, and it subsequently drove design standards and practices by which compromises to performance, weight, cost, materials and other factors were necessary to result in a producible part. With additive manufacturing, the restrictions from DFM are greatly eliminated, allowing designers the freedom to create, optimize and push the limits of component development. As a result, designs become lighter, structural capabilities and product durability increase, products perform at higher efficiencies and temperatures, and assemblies are eliminated. All of these results combine to equal lower total cost. 2) Additive-manufacturing processes need to be fully integrated with EDM, multiaxis CNC, surface finishing and other high-precision machining operations within the confines of traditional manufacturing operations. A common misconception is that additive manufacturing will replace or eliminate conventional machining. Although 3DMP allows for the creation of highly advanced, complex designs, it does not necessarily produce end-use features required in many applications. For example, due to the additive process, the resulting surface finish and tolerances often result in the need to selectively machine certain features. It is critical during the DFM process that the design and manufacturing teams communicate and coordinate activities to produce an additively produced design that is optimized not only for the AM process, but also for the conventional machining required to produce a true end-use component. The ability of 3D metal printing to build parts directly from feedstock (metal powder, wire, etc.) eliminates the large investment in tooling lead time and cost found with other processes. Early in the development cycle of a product, the manufacturer can produce prototypes and end-use parts with minimal post-processing tooling, which accelerates times to market. 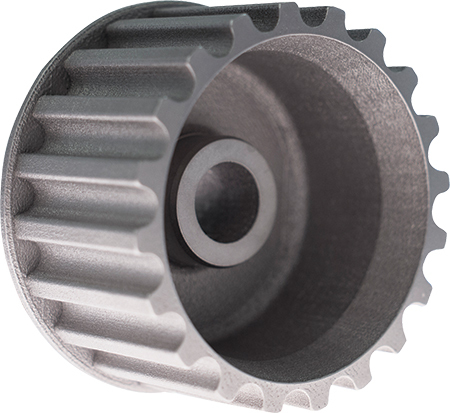 Shown is a stainless-steel oil-pump pulley, created on a direct-metal printer. Although additive manufacturing can produce highly complex end-use parts, it also provides excellent opportunities to enhance current processes. 3DMP processes also provide the ability to optimize and develop advanced techniques for current processes such as investment casting, injection molding and precision machining. Injection-molding dies, for example, can be designed and 3D-printed with conformal cooling passages near the surface of the die. This design enhancement creates more efficient cooling and as a result reduces injection time-in-die. Ultimately, production rates increase and product costs decrease, while simultaneously improving die life. 3) Additive Manufacturing reduces barriers to effective low-volume production. The ability with 3DMP to build parts directly from feedstock (metal powder, wire, etc.) eliminates the large investment in tooling lead time and cost found with conventional machining. Early in the development cycle of a product, the manufacturer can produce prototypes and end-use parts with minimal post-processing tooling, which accelerates time to market. In addition, 3DMP reduces the potentially large investments in casting/forging tooling and numerous machining and transfer fixtures. As the development cycle transitions from low-rate to high-rate production, the impacts are even more noticeable. Often times in the process of ramping to high-rate production, multiple duplicate tools are required to produce castings, forgings and other raw material sourcing streams. These tools require additional investment and lead times associated with tooling inspection, validation, recurring maintenance and ultimate replacement. Metal printing is just one manufacturing tool available to the manufacturer, enhancing the entire manufacturing supply chain and allowing for selective utilization of the strong points of each process. 4) Additive manufacturing is not a plug-and-play process. AM often is portrayed as a process in which a user simply loads a 3D model into the machine, hits the print button, and hours later a finished part is waiting. This portrayal oversimplifies the process and fails to capture the true complexity of additive manufacturing. Although it is true that the 3D equipment utilizes the 3D model as the primary input to build the desired geometry, several steps lie between creation of the designer’s CAD model and achieving a successfully built component. Due to the layer-by-layer build of the component within the 3DMP machine, the designer and manufacturer must consider several factors when preparing a build. The most notable item is orientation within the build chamber of the machine. This build orientation not only represents the XYZ location of the part, but also the rotation of the part relative to the build plate. Since the part builds layer-by-layer on a flat plane, the manufacturer must understand how those layers will interact and behave during the build process. Sacrificial supports often are added to the design, which play a key role in creating a high-quality, dimensionally accurate product. These supports provide structural stability to mitigate thermal stresses, and help maintain dimensional and metallurgical accuracy. After receiving the CAD model, the manufacturer must determine the optimum orientation to minimize the support structure while optimizing build time and the quantity of parts created within the build. 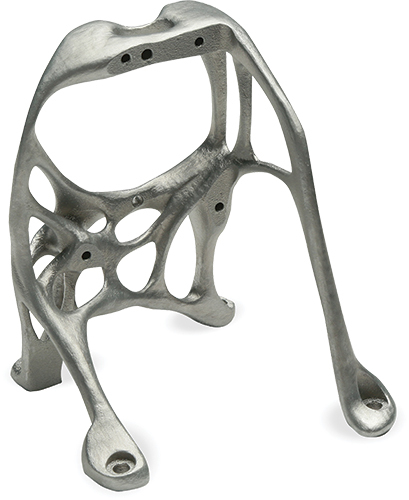 5) The material capabilities for additive manufacturing are nearly endless. Every year more and more materials become available for 3DMP, as more products are developed. The process already is capable of producing many of the standard alloys used across industries, including stainless and tool steels, aluminum and titanium alloys, super-nickel alloys and transition metals (gold, copper, tantalum, etc.). These materials result in printed parts that exceed cast properties, and in many cases rival wrought properties. See also: Methods Machine Tools, Inc.